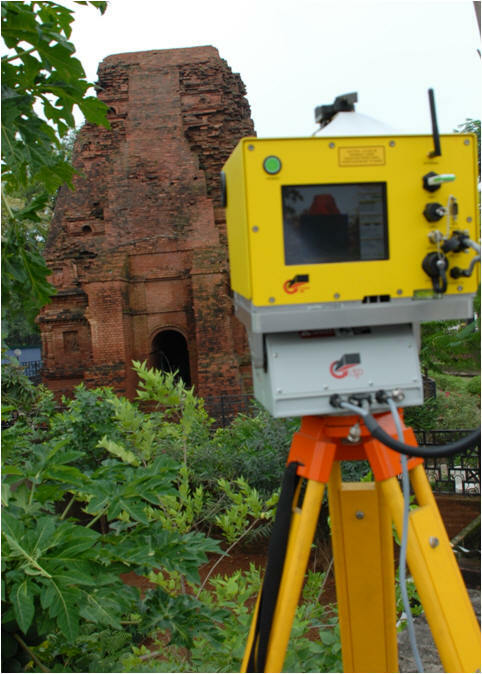 Terrestrial Laser Scanner is a ground based LiDAR system for capturing accurate and dense point cloud (i.e. millions of points with their X,Y,Z coordinates) at high speed. It is an active sensor which emits laser pulses for measuring the distances to objects remotely. We have procured ILRIS36DER from Optech Inc. Canada, which can measure the coordinates of millions of points on the surface of an object. Point density is generally very high resulting in quasi range images of object. Sensors like GPS and digital camera can also be integrated with ILRIS36DER. The ILRIS3D6ER can measure up to a range of 1500m. The instrument permits 3600 scanning. Terrain mapping for large scale maps and 3D terrain modelling, etc. Highly precise (Interval ~ 10cm) and accurate contour mapping. The list of application areas is large and several new applications are possible in view of the potential that the technology holds. Visit again to see the results of our work using TLS A palm tree captured by TLS: only one scan !